Once we reach age 40 to 45, our eyes lose the ability to focus on objects that are up close - especially in low-light situations, such as reading a menu in a restaurant. This condition is called “presbyopia” and it affects everyone. With Balanced Progressive™ Technology, CooperVision Biofinity® multifocal contacts allow you to see near and far objects, along with everything in-between - all with the clarity and comfort you deserve. And you’re free to wear these lenses for up to 30 days in a row. Thanks to our exclusive Aquaform® Comfort Science™, Biofinity multifocal lenses allow plenty of oxygen to pass through to your eyes. And their natural wettability won’t rinse off. You’ll enjoy excellent vision with a soft, comfortable lens that’s healthier for your eyes. If you’re over 40, why pull out eyeglass readers or let traditional bifocal contact lenses slow you down? 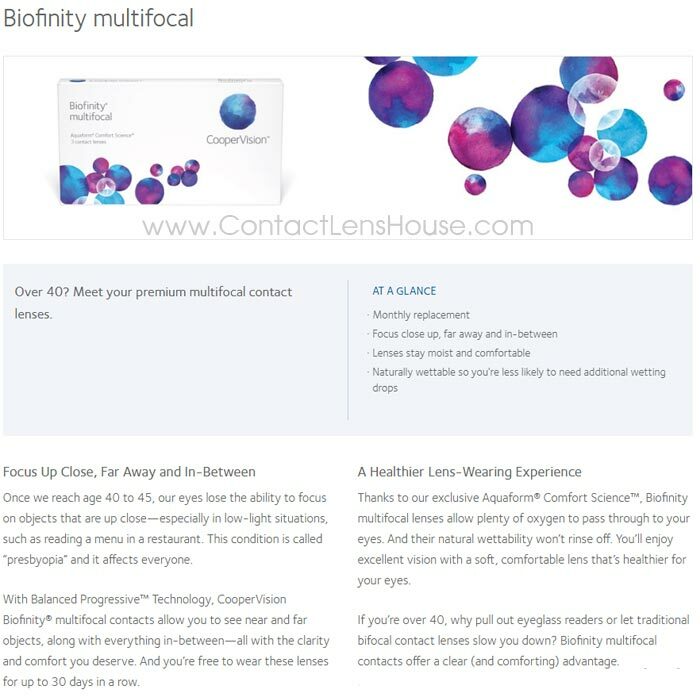 Biofinity multifocal contacts offer a clear (and comforting) advantage.